These are absolutely lovely pieces of natural Amblygonite (pronounced am-Blig-o-night). Usually found as a white-ish, pale lemon or yellow-ish coloured rock, these pieces are from Brazil and have a great colour. This is not one of those crystals that you see for sale that often as Amblygonite is. lets not say rare, but rather unusual. Add to this that the clear see through ones are quite sought after to set in expensive jewellery and you'll see why not much of it comes to the market. These are all natural pieces, and all lovely too ! 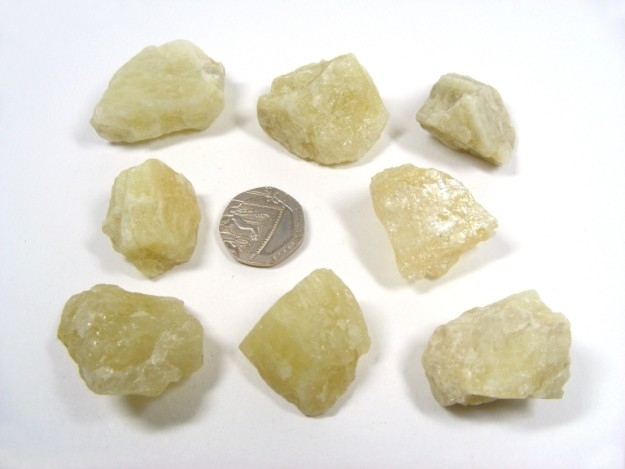 Amblygonite is believed to assist with walking disorders and is also thought to improve our vision. It is believed by some to provide relief from inherited genetic disorders. Amblygonite is a calming and a soothing mineral and may be used to grid large areas where energy needs to be stabilised or equalised, for example in shopping centres or in classrooms or in a large house where lots of people live. It is an excellent mineral for those studying music, poetry and the arts. Amblygonite can help us to increase our own sense of self worth and to promote our own self confidence too. It helps us to develop empathy and thoughtfulness towards others, but at the same time it can also help us to relieve our own pent up emotions. Amblygonite helps us to see both sides of any argument. It also helps us to understand why we just have to end some relationships, and when we do have to do this, it can help to relieve any anger or unpleasantness. Amblygonite helps us to realise that we will have another life, on another plane of existence, after this life finishes.